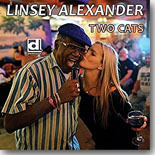 Chicago blues septuagenarian Linsey Alexander returns with another fine Delmark release,Two Cats. It's this month's Pick Hit. The biggest reason Samantha Fish's latest CD, Chills & Fever, is our Surprise CD of the month isn't because we've overlooked it since its March release, but more because of the high quality of music as Ms. Fish continues to broaden her musical boundaries. It's one of the top CDs of the year. Our Flashback feature this month looks at a new book by Chicago blues veteran Twist Turner, Blues With A Twist, as he takes the reader on a trip down memory lane with stories from his 50+ year musical career. It's only available in digital format now, but we can't imagine that some publisher won't eventually get Blues With A Twist into conventional book format. Our What's New section features new CDs from The Nighthawks, John Mayall, King James & the Special Men, Paradise Kings, Gina Sicilia, Micki Free, Hot Roux, Mark Cameron Band, North Mississippi All-Stars, Jim Allchin, Andy T Band, and more.